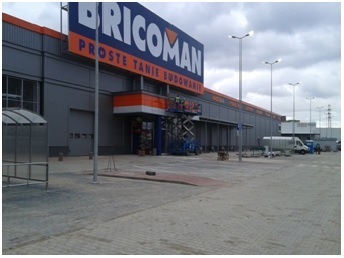 In March 2015 we completed the investment supervision of the commercial facility Bricoman at Białowieska Street in Szczecin. The facility of over 8 000 m2 has been designed as a one-floor building with a two-floor office and social part and necessary infrastructure. A parking lot, maneuvering roads and sidewalks were designed around the building. BatiPlus engineers provided investment supervision in all areas during the whole period of the facility construction along with land development and external infrastructure. Moreover, a team of inspectors was actively involved in the final facility acceptance. Bricoman is a chain of repair and construction stores for all who build, renovate and furnish their homes and apartments. The first store opened in May 2007 in Warsaw. Bricoman Polska belongs to the international GROUPE ADEO, which employs more than 73,000 people in 25 companies over the world.